All the player information from the core rulebook, suitable for anyone intending only to play and not GM the game. 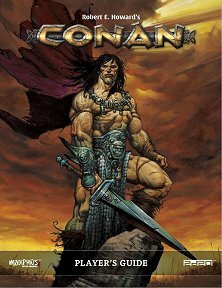 Publisher's blurb: "The Players Guide to Robert E. Howard's Conan: Adventures in an Age Undreamed Of takes you into the world of Conan the Barbarian, a place where astonishing heroes battle loathsome monsters, raise swords against dire sorcery, and travel to exotic and unknown lands! "Within these covers you'll find all the information you need to create a wide range of characters, whether heroic barbarians, bold rogues, seasoned mercenaries, wise priests, stealthy archers, hardy nomads, or more! "The Conan Player's Guide is aimed firmly at players of the game and contains content drawn entirely from the Conan Roleplaying game core book. If you own the core book, you don't need to purchase this book."